Gwyneth Walker: Yes, This is a Business! Yes, This is a Business! Many composers have areas of instrumental performance expertise. Alas, I have none. However, I frequently concern myself with matters regarding performances and commissions, so perhaps I can offer some helpful (or at least enthusiastic) thoughts here. I always write music for specific performers and specific performances. I always have done this, and cannot imagine writing "in a vacuum", although I recognize that much valuable music is composed in this way. At high school and college, I composed for various choruses, chamber ensembles and even local orchestras. During graduate school years, the works were more course-oriented, and I temporarily lost touch with the performance-based composer I had been. However, after graduate school, I once again resumed my writing for my performer-colleagues. From each live performance of my music, I learned a great deal from the performers about writing for their instruments. I also gathered an increasingly large list of names of performers interested in performing my music. This happens to many composers when they work with performers. Gradually the list of performers grew to the extent that I needed to keep files of the names and addresses. A few commissions came in, as did requests for the purchase of my scores. I pursued publication. 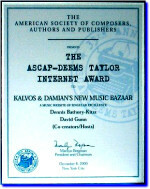 I learned about ASCAP. This composing career was beginning to demand some business skills, I could see. I have never had any business training, but I have always been an organized person. And this began to become helpful for me. I compiled a list of my (better) works. Eventually, I put this list into the format of a catalog, with titles, instrumentation, level of difficulty, duration and price for each work. No sooner did I complete the catalog than I received purchase orders, and was able to put the newly formed organization to work for me. I should mention two things here: firstly, compiling the catalog necessitated going back through all of my existing (120!) works, sorting through which pieces should be filed away in a closet never to see the light of day, which were fine as is, and which needed revision. All in all, the process of sorting, revising, recopying and cataloging my music took nearly a year -- a painstaking year in which no new music was composed. But the time and effort were well worth it, for I emerged at the end of the year with the music in order, ready to be shown and sold, with a catalog as a guide. Secondly, at some point in here, I took a very huge plunge -- I quit my teaching job at the Oberlin Conservatory. I wanted to compose full-time, and I thought I had better give this all of my efforts while I was still relatively young. So, at age 31, I left academic employment and, with some fear, set out to build a career upon my composing skills. About performances: I believe that all composers can gain many performances of their music if the music is playable, communicative and well-written, and if the composer is organized enough to have the music available when requested. Meeting performers at their concerts is also important. I feel that a composer cannot live in his/her own world entirely. Music is a communicative and social language. It requires composers, performers and audiences. And all three need each other. About commissions: these are available, too. Performers often commission new works, as do presenting organizations and almost any group imaginable. But a business sense is important here. The composer must know how to initiate a commission and charge the appropriate amount fair to both composer and commissioning organization. Also, the composer must have a reputation for completing work on time, and for creating quality work well-suited to the performers premiering the music. I have repeatedly stressed the business skills. Yes, this is a business. And if one is unwilling to treat it as such, to learn about the business aspects of composing, and to work at taking care of these matters, one should earn one's living at some other job, and compose in one's free time. But composing is all I want to do; I want to do it well. And I want my works to be good enough and popular enough to engender performances far and wide. So, in order to reach my goals, I have had to put in the time to compile my catalog. I regularly spend three hours a day (in the evenings) on the business aspects of my career; I compose every morning for four to six hours. As a result of the quality of works in my catalog, and the number of performances and commissions for these works, I was able to garner a publishing contract with a major publishing house. This situation has enhanced the performances and commissions. And the income from this business sustains me so that I can continue to devote all of my time to my composing (or related business activities). There is no secret to this career evolution. And there is no secret to gaining performances and commissions. These all stem from the same source -- writing music that performers want to play and audiences enjoy hearing, and handling the music in an orderly and businesslike manner. There is a great call for new music everywhere, and a living can be made from composing this music. At the very least, even if making a living from composing is not a concern or a practicality, composers can experience the joy and excitement of hearing their music played often, and of receiving requests to create more music for performers who respect the music.